September is around the corner. Children – and parents – are preparing for the new schoolyear, and business will pick up as usual after the holidays. Time to get fully up to speed again! To give you an update on what happened in Cumul.io last month, here’s a short overview of our August product updates. Are you looking for a way to create a hierarchy on top of your existing flat data? It was already possible in the past, but now we’ve made it even easier to edit hierarchies. We’ve launched a ‘revamped’ version of our hierarchy editor! 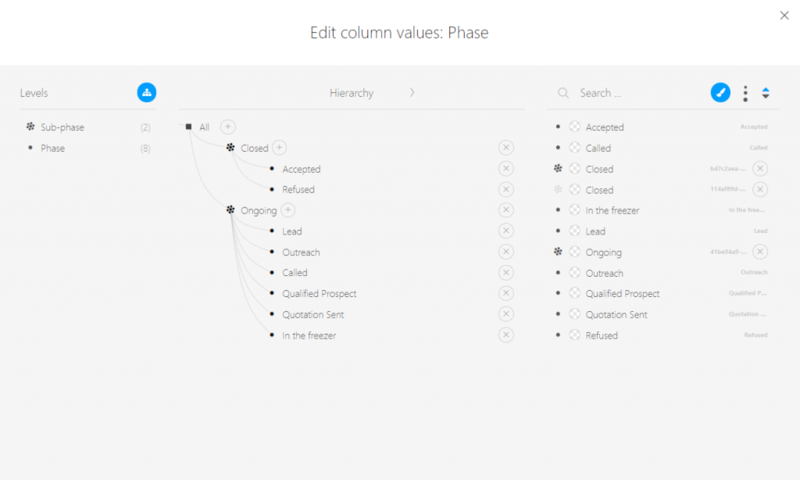 With simple drag & drop, you can create sub-levels for all your columns, and group together any values you’d like. We’ve been working continuously on our platform’s performance, to make sure you have the best experience while creating and integrating Cumul.io dashboards. Thanks to recent improvements, we were able to further speed up the loading times for dashboards and charts. Especially within dashboard or chart integrations, the charts will now need minimal loading time, to ensure a seamless experience for your end-users, within your platform or portal. We’ve added 2 new charts to our library: the sankey & alluvial diagrams! They are perfect for visualizing how your data flows from one category to another. But what’s the difference between sankey and alluvial? The sankey diagram visualizes the flow from a source to its destination. For example in the chart below, you’ll see how different sources of energy find their destination in energy use. You can easily spot that wind & thermal generation are the largest providers for the electricity grid. But at the same time, more than half of the thermal generation results in losses. The ‘arrows’ in the chart are typically proportional to the quantity of the flow. In that way, you can easily see which specific element has contributed the most within that flow. In addition, you can move the nodes within the chart interactively – just try it out above! Rather than source-destination, an alluvial diagram shows the changes between different categories in your dataset. The biggest visual difference with sankey is the magnitude of the arrows: while sankey gives an indication of the quantity, the alluvial diagram will rather show the proportions of the distribution for each category. Flows are visualized from one category to another. So, the alluvial diagram helps you interpret how your system is distributed, and more easily spot correlations between your categories. In the example above, we visualized the deaths on the Titanic by age and traveler class. As you can see, proportionally more male than female passengers died. In addition, the chart seems to indicate that people travelling in 3rd class had a higher chance of not surviving the Titanic sinking. We’ve added a couple of extra features to our existing charts. See what’s new! The choropleth map is our most used map chart by far, so we decided to add an extra feature to it. Just like you can filter interactively on a bar chart by clicking one of the bars, you can now do the same with your map! Want to filter your dashboard to show only data for certain countries, provinces, cities? Simply click on your map and it’s done! 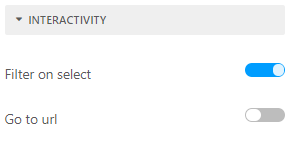 You can enable or disable the interactivity feature in your chart settings. Showing a variable y-axis in a line chart has been a topic of controversy within data visualization. Many argue that it exaggerates what the data is really saying. However, when showing an evolution in time, sometimes it just makes sense to have your y-axis start from a different value than zero. Think of values that never drop to zero, like human body temperature. From that perspective, our line chart now allows you to add a variable axis, which will start your y-axis at the minimum, and end it on the maximum of your measure. In the case below, you’ll see the evolution of the number of school students. Since the lowest number of students is around 200.000, your trend line will become much more visible when enabling the variable axis. Can’t wait to start using these new features? Simply go to your Cumul.io account and start playing around. Happy exploring!